An early Valentine’s Day card to the grandparents I never knew. Tuesday, February 14th, is Valentine’s Day. And it was on that day, 94 years ago, that my German grandparents tied the knot. Don’t they look like a happy bunch! I think it must have been against the law or something to smile in a photo back then. The older couple, seated, are Hugo Ernst’s parents, Hermann Eduard Geissler and Emma (Graumüller) Geissler. Marie’s mother was dead by this time.3 For whatever reason, her father wasn’t in this picture. 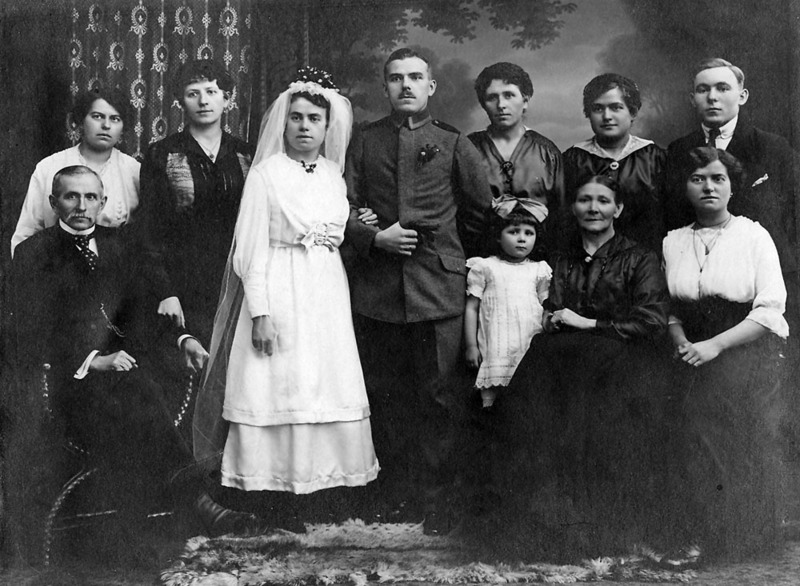 It’s possible this picture was taken after the wedding, with his family in Thüringen, rather than in Bremen, although I think some of the others are Marie’s siblings (and perhaps a niece) as well as Hugo Ernst’s sisters. I never knew any of these people. I never met my father’s extended family. Even my grandparents were dead before I was born.4 So I never had the chance to talk to them about what it was like to leave behind everything they knew when they emigrated to the United States,5 settling in Chicago.6 To leave the grave of their first-born, a daughter, Marie, who died in Bremen as an infant.7 To pack up their surviving three-year-old child — my father — and take him across the sea. And to begin again in an entirely new world. For the longest time, I confess, I didn’t have much appreciation of their immigrant experience. They came over in the 20th century, not the 17th; they didn’t face the terrors of long voyages in small ships. They weren’t the first in the family to come to America; Hugo Ernst had two aunts,8 an uncle,9 cousins10 and even three sisters11 who had come before and were waiting in Chicago when he brought his small family over. Yes, they were leaving the life they had known, but to anyone living in post-World War I Germany even the unknowns of Chicago must have seemed so much better. But there was a huge difference between my experience and theirs. I had a round-trip ticket. Sure, I struggled at times. But I knew I was going home at the end of my visit. They were trying to make a home in a new land. Okay, so maybe it wasn’t the pilgrims. But it wasn’t a cakewalk either. Their decision to make that new home took a great deal of courage and determination. 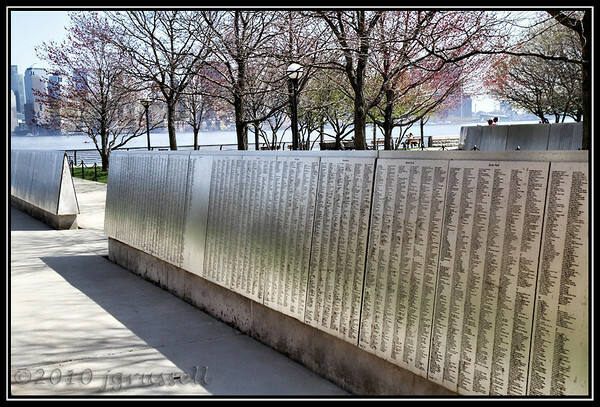 So when the Ellis Island Foundation set up its Immigrant Wall of Honor, there was only one thing I could do: I made sure their names were added to it. Happy Valentine’s Day, Hugo Ernst and Marie. And happy anniversary. Ah, yes, a cheerful happy wedding party. I think they had to stand very still — or sit very still — and not change their expression while the photo was being taken, which apparently took a while for the exposure to be recorded. Hence, no smiles. Easier to maintain a frown, perhaps? Good idea about the Immigrant Wall of Honor. I shall have to do that, too. I assume it’s permitted to honor them on it, even if they came before Ellis Island? The American Immigrant Wall of Honor is open to all entries. Included are names representing all ethnicities, all years of arrival, all points of entry, and all modes of travel. Names represent families and individuals, both living and deceased. Some names have been inscribed to commemorate the centennial of an ancestor’s arrival. New Americans inscribe their names to celebrate their naturalization. The common element that ties these names together is the celebration of American immigration. I counted five “smiles,” a groom that is handsome and stately, and the little girl looking like she is wondering what would happen if she moved. I have to tell you, I absolutely love the look on that little girl’s face. I think I would have liked her! Thanks, Bill. And a Happy Valentine’s Day to you too! Thanks, Celia. I wish I had known them, but their courage was part of what lets me be who I am, and for that I am most grateful. What a nice tribute! I’m always struck when I hear that people never knew their grandparents. I not only knew all my grandparents well into my adulthood; I had 5 great-grandparents living when I was born, and two of them lived till I was in college. My last grandparent died just 2 years ago at the age of 102. It was amazing what she could remember from her early childhood, so needless to say she was of great help in my family research. Thanks, Debi. I’m very jealous of your situation — so many older generations! I literally never met a single solitary soul — not a cousin, aunt, uncle, nobody — on my father’s side. Not one. Now you might say my mother’s side made up for it. I certainly knew my mother’s parents — I was grown before we lost my maternal grandfather, and my maternal grandmother lived until 1995 (age 97). And I had (and still have) a roughly a kazillion (give or take) aunts, uncles, first cousins and more distant cousins on my mother’s side and many of us remain very close. But only one of my maternal great grandparents was still alive when I was born and she died when I was only 3. I agree with Barbara about the technology affecting the smiles – however, some of these people look like they’re damn near grimacing. Perhaps that’s more of a cultural thing than an actual “we’re grumpy to be here” kind of thing? I do like the second woman from the right in the back, however – looks like she’s trying to sneak a smile in there, rules and customs be damned! And I’m jealous of you and your relationship with our grandfather 🙁 He died on my mother’s birthday, 11 months before I was born. But I do know lots of the family stories, which is a good second. Well, I do declare! Look who’s here! Hiya, Paula! I agree about the woman in the back. Wish I knew who she was. I think she’s one of Marie’s sisters, but I don’t know for sure. As for our grandfather… I know… I know. It’s not fair that your mother was born AFTER at least one of her nieces. But you DO have better physical proximity to the aunts, uncles and cousins so you DO have more of the family stories than I do!